By almost any measure, Netflix, the Internet television "network" that has changed the nature of the industry, is all the rage. After announcing blowout first-quarter revenues of nearly $1.57 billion and 4.88 million new subscribers – well above its 4.33 million guidance number – Netflix Inc.'s (Nasdaq: NFLX) stock soared over 25%. Indeed, in a moment you'll see how we can ring up a 280% profit in the Netflix "after-party." Take a look at the chart below. I've labeled NFLX's earnings week cycle the "bump and run." The bump and run is a series of occurrences that can happen during the week of earnings announcements regarding popular stocks. During the week of April 13 when Netflix announced earnings, there were at least three opportunities to get into NFLX stock – and make money – if you knew where to look. That ship has sailed… but we don't want miss the next opportunity, which is coming up fast. Let's take a minute to go through them all, and I'll show you what I will be doing in this final chapter of the Netflix "bump and run!" Typically, a day or two before an earnings release, stocks will tend to gyrate in a tight range. This is much like a runner that is stretching, and getting his or her feet planted firmly into the blocks before the starting gun goes off. This is exactly what happened to NFLX stock. Before the report, long traders bet that the stock would go higher, short traders bet that the stock would go lower and fund managers hedged any positions they had. So the question is: Which way is NFLX likely to go? For many it might have been up, due to all the hype about a great quarter or on news of the latest in the pipeline of TV series produced by Netflix. Or perhaps it is simply the 300 million users outside of the United States that could become potential subscribers. Nonetheless, the question on smart traders' minds is simple: How far is this stock going to move after earnings? One way to answer this question is to look back at how NFLX stock behaved before and after earnings were released in the past. The table above tells me that over the last four earnings cycles, NFLX has averaged a gain of 9.29%, or in this case about 45 points, from the stock price before earnings. Let's hold on to this number for a moment. Here's the next question – is there a way to help predict a future earnings price movement? A smart options trader doesn't know if the stock is going to go higher or lower after an earnings report, but has a very good idea of how far a move in either direction it is likely to go. That's because he looks at the short-term, near-the-money options as a predictor of future price movement. 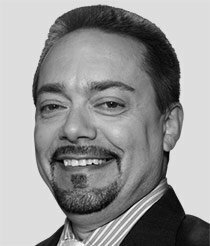 Option traders will take the short-term prices of the at-the-money calls and puts and add them together to get an idea of where a stock is likely to gap – that is, move sharply – after the earnings are released. So looking at the "Predictor," traders expected NFLX to open roughly 50 points higher or lower the day following earnings. So where did NFLX open after earnings? 532, or 54 points higher… not a bad predictor. 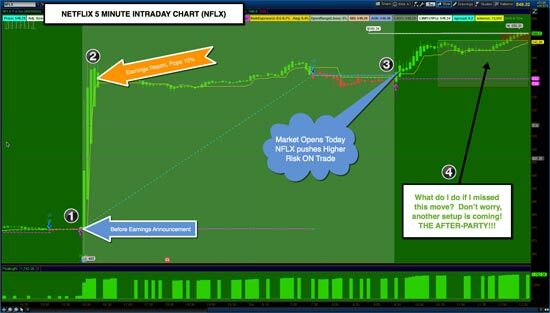 Now let's put these puzzle pieces together: we know that NFLX had a predictive pattern to head higher, had done so in the past by over 9%, and the options told us going forward that traders were expecting a better than 10% move on this coming earnings report.